In a letter dated June 1, 1962, the newly formed Film-Makers’ Cooperative offered their first list of films that were available to rent. Fourteen filmmakers were represented. Sunday by Dan Drasin. Shot and completed in 1961. 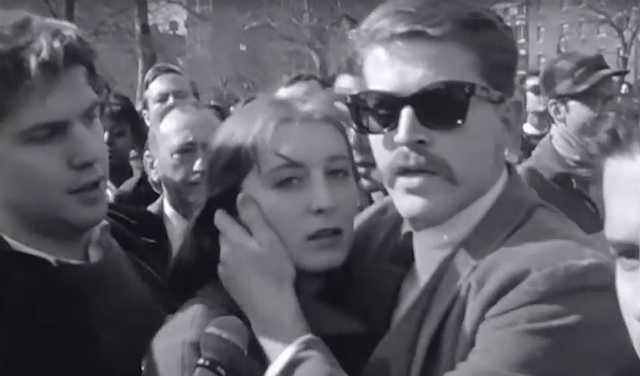 According to the filmmaker, the film was shot entirely in 16mm B&W on April 9, 1961, capturing a protest made by folk singers in New York City’s Washington Square Park that was challenged by police officers. Twelve American filmmakers will receive a total of $118,500 from the Ford Foundation in its first move to aid creative artists in motion pictures. The grants range up to $10,000 for a one-year period. They will be used by the recipients either to produce short films or for travel and study.